Shopping for young children age 6 tends to be easier than shopping for older ones. However, it can be a challenge to think of something that will be used often by a little girl who already has a lot of toys and games. Here we have a review of almost 40 top gifts and games for young girls, so there’s sure to be something here that she’ll love. We also have a helpful FAQ to help you figure out what kind of gift would be ideal for the little girl in your life. 1.35 What are Cool and Popular Gifts for 6 yr old Girls? 1.36 What to buy a 6 year old girl for Christmas? 1.37 Awesome birthday gift ideas for girls who love Mermaids? After looking at this massive review of 39 toys and gifts for girls to make sure you find something that suits their every desire, whether it’s their birthday or Christmas. In this review, the 6 year old girl birthday gift ideas are unique and exciting, from outdoor to indoor present, arts and crafts and loads more. This girl’s 16 inch bike is ideal for children aged around 5 year old to 8 years old. It has loads of cool features sure to be loved by a little girl, including a seat for their favorite doll or plush animal, a basket at the front and streamers on the handles. The bike is great for beginners, as it has easy to use coaster brakes rather than hand brakes. It also has removable training wheels, making it an excellent bike to grow with your child. There is also a safety guard around the chain to protect your child’s legs and feet. Girly girls are sure to love the look of this BMX bike. It has gorgeous purple tires and a pink and white frame decorated with flowers and dolls. This bike is every little girl’s dream come true! Osmo is a coding game suitable for slightly younger clever kids. It works with an iPad or iPhone and requires a base which is sold separately. There are loads of different Osmo games available now, so there’s sure to be something your child will love. This one is ideal for girls who are interested in music, as it can be used to create original compositions by layering different beats and instruments. The Osmo coding game is a great toy for girls age 6. Educational games like this are a great way to make the most of the time a child spends in front of a screen. With Osmo, children are engaging and interacting with the content on the screen, rather than sitting passively watching. IT skills are becoming more and more important, so getting children started with learning coding at a young age is sure to put them in a strong position for the future. This beautiful dollhouse would make a great birthday gift for 6 years old girl. It is licensed by Disney and comes filled with furniture. There is also a bendy Lumiere figure included, to add to the charm of this lovely house! This dollhouse is perfect for those who love Beauty and the Beast – each room is filled with beautiful artwork and details from the movie. The Disney dollhouse stands at almost 4′ tall, making it perfect for older children too. It is also wide enough for two children to play together, and there are 3 stories in the house meaning there’s plenty room for everyone. The dollhouse is the right scale to be used with Barbies and other similarly sized dolls, meaning it can be used with your child’s existing doll collection. This is a great creative toy for 6 year olds. It can be used to create outfits simply by using the rubbing the crayons over the templates. The kit includes 15 plates featuring various outfits, some paper and coloring pencils, and a tablet to hold everything together as you draw. Everything comes stored neatly in a handy folding case, making it perfect for taking out and about. The craft kit for 6 year olds comes with a folio full of ideas for what your little girl can create with it. Parents will love reliving their childhood with this classic toy, and it is even compatible with the original Fashion Plates if you still have any in the attic! This is a great present for a 6 yr old girl. It can be used to help create the first scrapbook – it includes a 48 page book, stickers, gems, stencils and colored papers. There are also scissors, glue sticks, buttons and washi tape, meaning your little girl can get started straight away. This kit is ideal for creating a memory book or a photo album filled with photos of friends and family. It would be great to use to make a book as a gift for a best friend too. The book measures 10 inches square, making it the perfect size to fill with plenty of memories. Girls are sure to have hours of fun creating their very own scrapbook. This beautiful set of Disney princess dolls would make a wonderful 6th birthday gift for a girl. The set includes 11 classic princesses, as well as an extra costume for Snow white, two dwarf figures as well as some extras such as the bluebird and poisoned apple from the movie. Each Disney doll has lovely details and looks just like the movie characters. Their dresses and costumes are brightly colored and have sparkly details, sure to be loved by little ladies. The dolls are 11 inches tall and have jointed elbows and knees making them poseable and ideal for interactive play. Little girls are sure to have years of fun playing with these gorgeous dolls, and they will look great displayed on a shelf in between play time, or when your little girl gets too old to enjoy playing with them. This huge, 500 piece kit can be used to create just about anything your child can dream up. The pieces come in a range of colors, and each flake measures around 1.3 inches in diameter. There are enough pieces to build some really large models or to build several models at the same time. The set is also great for siblings or friends to share. The building toy is a great gift for 6 year olds boys and girls. It is great for developing vital skills such as creativity, hand-eye coordination and spatial awareness. The flakes come in a handy storage jar which can be used to keep all the pieces together, and there is also an idea booklet included to give your child some inspiration. This beautiful set is a great gift idea for a 6 year old daughter who wants to be just like her mom or big sister. The pack includes 18 different colors, so there’s sure to be something to match all your little girl’s outfits. The nail polish is easy to apply and dries quickly, so parents won’t have to worry about the polish getting on the floor or the furniture. The girl’s nail polish set can simply be peeled off when it is no longer required, meaning you won’t have to worry about using polish removers. The nail polishes are non-toxic too, making them safe for young children. Little girls are sure to love the bold colors, and of course the princess images on each bottle. A craft set is one of the best gifts for a 6 year old girl. This one is used to design sparkly bracelets – there are 8 plain bracelets included, and over 400 bling decorations. The kit is ideal for a little girl to make friendship bracelets for her best friends, or to use at a party for each child to make their own. The bracelet design kit is easy to use and will keep little girls amused for hours. There are decorations in a range of shapes and sizes, so girls can create a whole range of different styles of a bracelet. There might even be some pieces left over which can be stuck onto other items to customize them. This fun, creative toy is the ideal Christmas gift for a 6 year old girl. It can be used to make 6 different styles of fairy fridge magnets or pin badges. The kit includes paint and brushes, glitter and plaster, as well as easy to follow instructions so kids can do the activity without much help. This kit is a great gift idea for a 6 yr old girl who loves fairies. It’s also ideal for a fairy themed party – you could even make up the magnets in advance and have each guest paint and decorate their own to take home. It’s a fun and easy to do an activity which is sure to keep kids amused for hours. This clutch bag decorating kit is a great gift for six year old girls. It includes one purse and over 500 decorative sticky mosaic pieces which can be stuck on to customize the purse. The design is already printed on the purse, meaning great results are more or less guaranteed. The mosaic pieces come off the backing easily, meaning it is easy for young children to do alone. The craft kit comes with lots of extra pieces, so you won’t run out halfway through the project. In fact, there will probably be some left over to be used on future projects. The purse measures around 5×8 inches – just the right size for a young girl to keep a few of her belongings in. This design-your-own headband kit can be used to create 10 different colored, satin, customized headbands. The kit also includes butterflies and flowers to decorate the headbands, as well as rhinestones, ribbons, and feathers. Young girls will have hours of fun designing their own headbands – they’ll have something to match all their outfits when done! This kit is a great birthday gift for a 6 years old girl, and it could be used as an activity at the birthday party. The kit is easy enough to use that children will be able to do it without adult help. Girls could even use the kit to make matching headbands for their best friends. The kit is a great way to pass a morning or afternoon, and girls will be so proud to wear their creations afterwards! This jewellery making kit is the ideal gift for a 6 year old little girl. It can be used to make 11 pendants and bracelets and is great for using at playdates or birthday parties. The kit includes over 200 pre-printed designs, which can be used inside the pendants. Some are black and white, so they can be decorated and customized as you wish. The pendant design kit includes everything needed to create the necklaces, including beads, necklace chains, cord and glue, as well as the different shapes and sizes of glass pendant. Younger children may need a bit of help with the kit, but it is a great way for parents and children to spend quality time together. This hair styling model is a great toy for a six year girl. It comes with over 50 pieces and accessories, including brushes, clips and a mirror. The model head also comes with a magic makeup brush – simply dip it in water and apply to the eyes and lips, and the color will magically change! The hair styling toy is great for little girls to practice their fine motor skills. They can thread beads onto the hair, and practice tying ponytails. It’s a great way for children to learn how to brush and style their own hair. Girls are sure to have hours of fun playing with this toy! This is the perfect dressing up costume to go with the hair styling set above! It includes the apron as well as 6 accessories, including a hair drier which makes sound effects. The apron features a name tag which your child can personalize with their name, or there’s the option to buy an overall which already has their name printed on it. The hairdresser costume features pockets on the front, for the accessories to be kept close to hand. This dressing up costume is great for encouraging imaginative play – children will love taking turns to ‘style’ their friends’ hair. A real mermaid outfit is one of the top gifts for a 6 year old girl. This set has a bikini top and bottom, a flower headband and of course the mermaid tail. The tail has snap buttons at the bottom, meaning it can be opened allowing your child to walk around more easily. The costume can also be used for swimming in, although it will be easier if used in conjunction with a monofin. The mermaid tail swimsuit comes in a range of sizes, to fit children aged around 3 up to 12 years old. It also comes in a huge range of colors and styles, some of which have longer tops, and extra fins on the tail. The swimsuit is made from a good quality material, which washes well without losing its color or shape. Overall, it’s sure to make any young mermaid lover happy! This projector makes learning to draw fun and easy. The kit comes with over 120 slides featuring different images, so there is plenty of choices to keep little ones busy. The drawing toy also comes with markers and some paper, so children can start drawing right away. Children can also use this kit to create a flip book, which is another fun activity to try. The drawing tool can be used to combine different images to create a varied scene, or to mix up different heads and bodies to create some fun characters! The toy is great for inspiring kids and helping them become more artistic and creative. Everything can be packed neatly into the projector case, meaning bits won’t get lost. The kit is therefore excellent for traveling with or taking to grandparent’s houses for example. This cute musical jewelry box comes in a choice of 8 different styles, so you’re sure to find the perfect gift for a 6 year girl. The designs feature fairies, ballerinas, and flowers, making them ideal for girly girls! Inside the box, there are storage compartments for different types of jewelry, including ring rolls and a drawer underneath for smaller items. There is also a mirror inside the box. The girl’s jewelry box plays ‘Swan Lake’ after being wound up using the key on the back of the box. It measures around 5x4x7 inches, making it the perfect size to hold a few small treasures. The beautiful box would look great on a shelf in any little princess’s bedroom and is sure to be treasured for years to come. LEGO Friends sets are perfect for girls aged six and above. This particular one isn’t too difficult to build, as it features just over 250 pieces. The LEGO set also comes with 2 mini doll figures, Anna and Noah, who will love taking a ride in the balloon once it is built! As well as the hot air balloon, there are also enough pieces to create a picnic spot for the mini doll figures to stop for lunch! The LEGO Friends Heartlake toy comes with several accessories, making it great for playing with after it’s built. There are plenty of pieces to make a fun interactive picnic scene including a gas bottle, a picnic blanket, binoculars and even a campfire. The kit is compatible with all other standard sized LEGO (not Duplo), and would make an excellent addition to any collection. This craft set is a great gift for girls age 6. It can be used to create a fantastic patchwork quilt without doing any sewing. The kit comes with over 40 fleece squares, each measuring 9 inches, as well as fringes, flowers, felt shapes and stencils to create letters shapes. The children’s quilting kit comes with 7 different colors of fleece, so the final product is sure to be bright and colorful. Tying the knots requires some patience, but it is great for passing a rainy afternoon, or for spending some time on during the school break. This vegetable cutting toy is great for children of any age who love playing with pretend food. The vegetables are held together using Velcro, so they make a great noise when ‘chopped’ in half! The vegetables and tools can all be stored in the table after use, which folds into a handy carry case, perfect for kids who tend to lose bits of their toys. The pretend food table is 23 inches long. The kit also comes with some tongs, plates and a cutting board. 6 year olds will be able to assemble the table by themselves at playtime and will love packing it up to carry it somewhere else. This is one of the best toys for a 6 year old little girl. It is a fun activity for parents and children to enjoy together, and girls will have hours of fun playing in the garden after it is ready. The kit includes everything needed to grow your very own garden, such as soil, a seed mix packet, and gardening tools. The toy is great for teaching children about caring for plants. They should start to grow within a few days of planting, however, it can take 6 weeks or more for the flowers to appear. The kit comes with a fairy figure, so the garden can be used as an interactive playset too. These flying toys are easy to use by even the youngest children – they are activated by motion so it’s not necessary to learn to use any complicated remote controls. It is controlled by using the hand alone – they detect how far away an object is and move away from it. So, the fairies will fly and hover above your hand! The flying remote control toys take around 30 minutes to charge fully, via USB, which then gives up to 8 minutes of flying time. Because there are 2 dolls in the pack, one can be flown whilst the other is charging. This cute girl’s backpack is ideal for children to use to take their things to school. It comes in a choice of 4 different colors – either purple, red or light or dark pink. The bag is easy to clean, and is waterproof, perfect for rainy days! The backpack has several compartments to keep different things separate within the bag. The children’s backpack comes with a small additional pouch which can be used to store some pencils or other little trinkets. It also comes with a cute bow detail on the front and a small doll which is attached to the zipper. It would be a great first schoolbag for a 1st grader. A karaoke machine is one of the top toys for 6 year old girls. This one can also be used to play your daughter’s favorite CDs, and it comes with 3 karaoke sing-along CDs too. The karaoke machine features AUX inputs and outputs, meaning it can be connected to an iPod, computer, television or amplifier. The kids karaoke machine comes with a microphone, so they can start singing right away. The machine also features an iPod device holder, so it can be used to play any of your child’s favorite music which keeping their device save at the same time. This Nerf gun is great for girls. It can be used to either shoot the 4 included foam darts, or it can be converted to a crossbow with the included attachment. The darts can be fired up to 75 feet, making this a great toy to use in play battles outdoors in the summer! This girl Nerf gun is great for those who have friends or siblings with similar guns. They’re perfect for the whole family to get together and play! Having a Nerf gun fight is a great way to get kids away from their screens and playing outdoors. These pink walkie talkies are great for allowing children a bit more freedom to venture away from mom and dad. They are ideal for use on a camping or hiking trip and have a very generous 3 mile range. The two way radios have 22 channels, to ensure the chance of interference is minimized. The long range walkie talkies for kids are a neat, compact size, easy for little hands to hold onto. They have useful features such as a key lock and call ringtones. The radios come in a choice of colors and styles, so there’s something to suit everyone’s tastes. This creative toy for 6 year olds can be used to make 6 hair bands and 4 clips, meaning your little girl will have a hair accessory to match just about every outfit. The kit comes with an assortment of bows, ribbons, rhinestones and adhesives. The hair accessory kit is great for helping children develop various important skills, such as hand-eye coordination, planning, creativity, and problem-solving. Girls will have hours of fun planning and create hair accessories for themselves and their friends! This scooter is the perfect gift idea for a 6 year old daughter. It has a unique, patented ’tilt to turn’ steering technique, which is great for teaching children how to steer. The three-wheeled design offers greater stability when riding. The Razor scooter comes with an extra bonus for little girls who love unicorns and horses – the unicorn plush can be removed easily, and doubles up as a hobby horse! Girly girls are sure to have hours of fun with this cute pink scooter! It’s a great way to get kids active and playing outdoors. This Disney watch is ideal for helping young children learn to tell the time. The hands are labeled with ‘hour’ and ‘minute’, and the Frozen picture on the face is sure to be a great incentive. The watch is great for young children, as it is splash resistant, meaning it won’t become damaged if it’s worn outside in the rain for example. The children’s watch is a great gift for girls age 6. The number dial on the outside can be rotated to help children learn when ’10 minutes’ is up for example. The strap of the watch is fastened with Velcro, meaning it can easily fit a range of sizes of wrist. The VTech Kidizoom is a great first camera for young children. It would make a great gift for a 6 yr old, and will continue to be enjoyed for many years. The camera has good features, such as 2 MP resolution and 4x zoom. The camera is strong and durable, so it will remain in good shape even if it gets dropped a few times. The camera features fun photo frames and effects which can be added to the images to personalize them. There are also games built into the camera for added fun! As well as taking photos, the camera can be used to record video and voice files too. A Micro SD card can be added to the camera to give more storage space. A stuffed animal bean bag chair is the best gift for 6 year olds who have loads of stuffed animals! It comes in two different sizes – the large one measures 38″ so can hold 60 or more stuffed animals, depending on their size. It comes in a choice of 4 fabrics too, so there’s sure to be something to match every little girl’s bedroom. The stuffed animal storage beanbag is great for keeping your child’s bedroom tidy. They’re sure to enjoy tidy up time with one of these – they will be rewarded for their tidying efforts by having a comfortable place to sit and relax. There’s an extra large zipper allowing easy access to all the toys, and there’s also a built-in handle to make taking the bean bag from room to room easier. These unique headphones would make a great birthday gift for 6 years old girl. They are a perfect alternative to earbuds or those which go over the head. The headband style headphones are much more comfortable for children to wear. They have a volume limit, to protect kids’ ears from music which is too loud. The children’s headphones come in a choice of 8 different animal styles, so there’s surely something to suit all little girls’ tastes. The cord is 52″ long, and the headphones can easily be packed in your child’s backpack for traveling. This is the perfect gift for a child who loves music! This dancing robot is the perfect remote controlled toy for girls. It has several different modes, to ensure it will provide hours and hours of entertainment. The robot can detect obstacles and avoid crashing into them. It can also be controlled using just your hand, so guiding it in different directions is easy. The pink robot toy can be played with for around an hour on a single charge, and charging takes about 2 hours. It has lots of fun features sure to keep kids entertained. The robot can dance and play music, which is great for making everybody laugh! There are 5 different songs, so parents won’t become annoyed by hearing the same ones over and over again. There is also a programming mode which allows the robot to learn up to 50 different commands. What are Cool and Popular Gifts for 6 yr old Girls? Every child wants to be popular at school and around the age of 6, they will be soon going to meet their classroom friends. My kid has the opportunity to dress up once a week at school and this dress is a great outfit gift for a little girl. 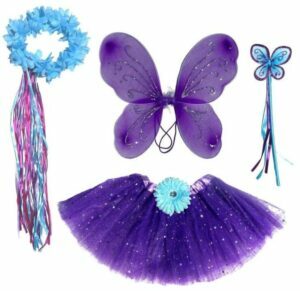 This Dark Purple & Teal Fairy Set is very popular and every girl enjoys dressing up as a fairy. The butterfly wings are cute and the halo makes them look like a little angel. What to buy a 6 year old girl for Christmas? 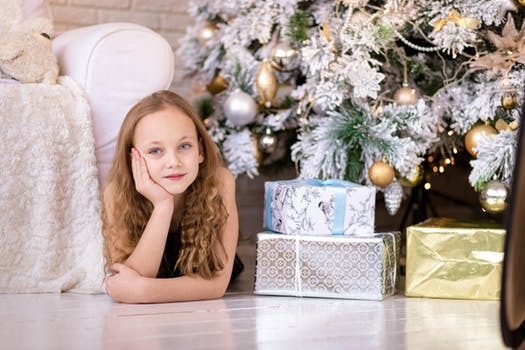 This is an age-old question for parents, what should we get for our daughter at Christmas? Well, there are loads of gifts to choose from, but one in particular that has always been a great gift at Christmas is LEGO. 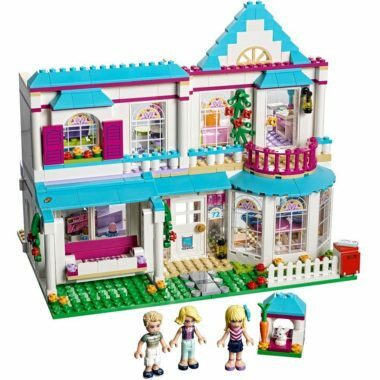 Lego sets for girls are very common presents and this LEGO Friends Stephanie’s House is something that will keep them entertained for hours of play. Awesome birthday gift ideas for girls who love Mermaids? The Scrapbook For Girls Mermaid gift idea is a great pick for girls who love everything mermaid. This is a top gift for a girl who loves to be creative and also be private about her ideas and thoughts. This scrapbook has a lock so only she knows whats inside, which girls age 6 love!